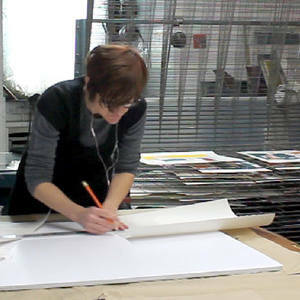 Watch a 60 second video of me making a screenprint @ julieevanoff.com/projects/ Drawing is the foundation of my art making, expanding into prints and animation. I am increasingly interested in symbols and icons and their capacity to hold complex sets of ideas as meaning gets attached to them. I think of my images as 'narrative instances' composed of figures that revolve around solitude, conflict, and confrontation. Exhibitions include: Brooklyn Museum, participating artist in Ulrike Müller's Raw/Cooked project; Come Together: Surviving Sandy, Brooklyn, NY; The Visual Arts Center Mississippi State University, Collapse; The Invisible Dog, If you see nothing say something, Brooklyn, NY; Gallery Niklas Belenius, Stories real and vividly imagined, Stockholm, Sweden.